Ga achter de schermen van Broadway met een gezinsvriendelijke 2,5-uur durende wandeling door het iconische theaterdistrict van New York City, met als hoogtepunt een reis naar Disney's vlaggenschip New Amsterdam Theatre. Slenter langs Broadway Avenue en leer onderweg over plaatselijke monumenten en legendes. Neem vervolgens een rondleiding van 1 uur in het New Amsterdam Theatre. 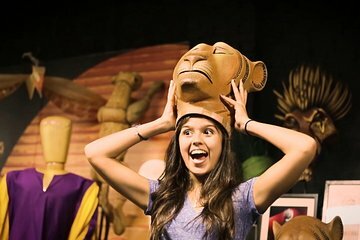 Een onsite-historicus deelt details over wat er gaat gebeuren met het maken van Disney-musicals als 'Mary Poppins' en 'The Lion King' en geeft je exclusieve toegang tot de prop- en kostuumsstudio van het theater, waar de shows echt tot leven komen. Toegang tot een prop- en kostuumstudio maken deze tour ideaal voor fans van Broadway en Disney. We had a group of seven from age 12 to age 80 and everyone loved the tour. Our tour guide, Collin was FANTASTIC!!! He was a great storyteller, enthusiastic and kept us entertained and educated at the same time. It was a wonderful morning! I absolutely loved this tour! The tour guide was so nice and funny and really made everyone feel included. I loved how it included a lot of background history on various Broadway theaters as well as the hands on aspect at the end. It was very cool to be able to see behind the scenes of Aladdin and see all the props from the previous shows. Favorite experience of the whole trip..
Due to the snow it was cold! Jocelyn found spots where we could gather inside to learn about Broadway. Highlight was definitely handling the props in the theatre. We loved every minute of the tour. Collin was an outstanding guide. He was knowledgeable and interesting bringing the history of Broadway to life. It was fantastic hearing about the life of a Broadway actor from someone with real world experience. The guides at the New Amsterdam theater were amazing too. Their enthusiasm and energy were contagious. We thoroughly enjoyed trying on the costumes and pretending for a moment that we were on the big stage. I would highly recommend it to anyone wanting a look into all that is Broadway. Fairly interesting, gotta love the trying on the costumes. For anyone with kids and who Broadway give this a go. Excellent guide told us about the history of Broadway as we walked past the theaters. He had photos to show us what it was like back in the early days. Then we went into the Majestic Theater where Aladdin is playing. Disney guides told us about that theater, let us walk on the stage and backstage, and then let us take pictures with costumes from various Disney productions. Enjoyed by all ages in our group.